If you’re looking for ways to cut costs even further, but still make creative and exotic meals, Carrie from Springs Bargains has some great tips for you about shopping at ethnic markets. 1. Stick to ethnic ingredients. Most larger ethnic markets stock at least a small amount of “American” foods, but these are often quite overpriced. So, it’s best to make a trip to the specialty market to get specialty food, and stick to your regular grocery store for pantry staples. 2. Don’t expect Whole Foods-quality produce. 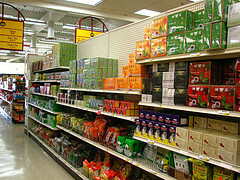 Most large chain grocery stores have pretty zealous quality control standards, and smaller ethnic markets just don’t. So, don’t always expect to have impeccable produce available at all times. My rule of thumb is to stick to the “ethnic” types of produce. Our local Mexican market usually has great quality in their peppers, but not so much in the green beans and lettuce. A few weeks ago I was at an Asian market and iceberg lettuce was 4 for $1. It was looking a little sorry, though, and if it had been on my list I probably would have paid more for it elsewhere. Their bok choy and mung bean sprouts were great, though! 3. Make sure you like it before you buy in bulk. Haven’t ever tried sesame oil before? You might want to buy a smaller bottle before you buy a gallon. This is the case with any product at any store, but bears keeping in mind for ethnic ingredients. The largest size may be the cheapest cost-per-ounce, but if you buy it and only use 1/4 of it because you discovered you didn’t like it, it’s definitely not the cheapest. Try it first, and then buy in bulk. 4. Find out if your favorite market runs weekly specials. Most ethnic markets don’t run weekly specials, but the ones that do usually have some smokin’ deals! Find out if your markets offer weekly deals and if you can view their ad online. Our Mexican market has a weekly ad and Wednesday and Thursday produce and meat specials that have prices that are often out of this world! They don’t have a wide circulation area, but you can look at their ad online, making it easier to plan your trip. 5. Make a list of recipes you want to make before you go to the market. For most people, an ethnic market isn’t going to be the place they do their weekly grocery shopping, and it may also not be on your main driving route. So, to save on time and gas, start collecting a list of the Asian recipes you want to make, for instance. Then, when you’re ready to make a trip to the Asian market, you can buy the ingredients (both fresh and non-perishable) for all of those meals at once. Carrie Isaac is a mom to three kids four and under, who love going to the Asian market and watching the live fish! She blogs about deals in Colorado Springs, and also does internet marketing for her husband, a Colorado Springs Realtor. Such good advice, I LOVE our Asian supermarket. Things I use all the time like coconut milk or soy sauce are a fraction of the cost there. I also find shrimp to be an incredible deal usually 70%+ less than regular supermarkets. Frozen dim sum is just awesome and a perfect treat to stash in your freezer for a cheap almost takeout! Ethnic markets have been amazingly helpful for me because I can often find gluten-free products and gluten-free flours to use. I have to read labels and know what I’m looking for, but the cost savings is tremendous! Great point, Sarah! We’re not GF, but I know I’ve seen things like rice flour and thought that they seemed way cheaper than at other places. Do you find that reading labels on imported items is just the same as reading labels on “American” food? I’ve always been curious if it presents a problem for allergies if, say, a Thai-based company calls something that could be an allergen by a different name, and you don’t recognize it. @Carrie Isaac, there can definitely be some areas of difficulty, but for the most part things have been labeled much the same. For example, I went looking around my ethnic market for 100% buckwheat noodles, which they definitely don’t have. They all clearly listed wheat as an ingredient. It’s worthwhile to do a little front-end research on what’s safe and what’s not, but if you know what to look for and what to avoid ethnic markets are a great resource for those avoiding gluten. Thanks for the post! I have a Mexican grocery store close to my house but I’ve been too afraid of high costs and Spanish to go it. Might have to look up a good recipe to try and go in and check it out. Thanks for the encouragement. I love my ethnic markets! I’m lucky to live in a big city (Atlanta), and we have lots of them to choose from. This winter, one of my favorites has had Asian cooking classes. A series of 3 for $10 each. And, when the class is over, they give you a $10 gift certificate. So, they’ve had the classes for free. It was really fun, and a great way to increase my knowledge of Asian food. This particular market is chiefly Korean, Mexican, and Russian. An odd mix that works well in their part of the city. And, it’s so much fun to go there! My preschoolers look forward to it all week. I love my Asian markets. The ones I frequent have amazing produce sections. I live in the desert and the chain groceries have horrible produce. The Asian markets are also my favorite place for seafood. And I love trying new-to-me sauces and ingredients I find there.